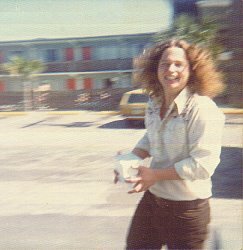 Gordon, Myrtle Beach, April 1976. This is Bruce's favorite photo of Gordon. Gordon left Newport News in 1974 heading north, unsure where he was going. At Richmond, he wasn't sure whether he would go to Washington, or to Charlottesville where Bruce was staying in a student house. At the last minute, Gordon headed for Charlottesville, and stayed for months with Bruce & friends. A memorable time. Click on photo, or use your browser's "back" button.